Suzanne was born in Oregon territory around 1824. Little is known about her early life or family, including her original Indian name, other than that she was a full-blooded Cayuse woman. She married the French-Canadian Mathieu Dauphin (c.1816-1867) in 1840. Born in St. Louis, Missouri, Mathieu travelled to Frenchtown in 1838 with several fur trappers. Between 1842 and 1861 Suzanne and Mathieu had eight children and lived in at least four different places. 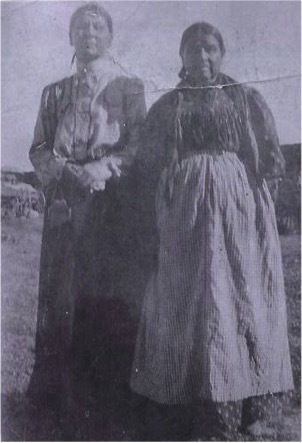 Their first two children, Abraham (1842-1879) and Catherine (1844-1907) were born in Fort Hall, Utah Territory, but by 1847, the family had relocated to the California gold fields in the Yuba River area, where Rosalie (1847-1878) was born. 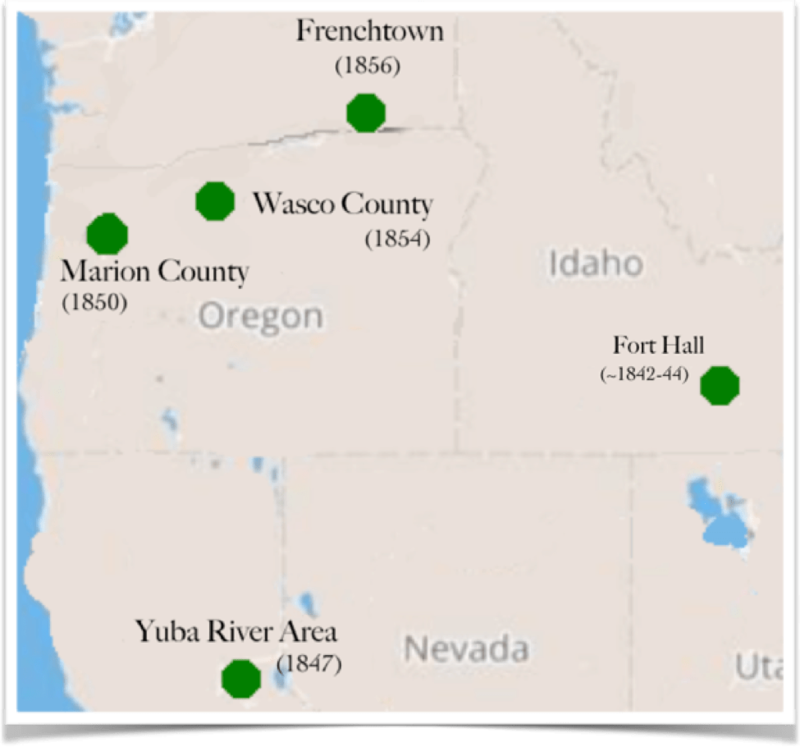 By about 1850 the family had returned to Oregon territory, living in Marion County and then the adjacent Wasco County until around 1856, through the births of three more children. At this point, they returned to Frenchtown, where their last two children were born. Suzanne and Mathieu were both Catholic— like many Indian wives of French-Canadian men, Suzanne apparently converted to Catholicism, and all her children were baptized and confirmed. Mathieu stood as godfather for the baptism of the Cayuse Five, who were executed in connection with the 1847 Whitman Mission incident. Mathieu also served as interpreter and witness at the 1855 Treaty Council of Walla Walla, where the Cayuse, Umatilla, and Walla Walla tribes ceded 6.4 million acres of land to the U.S. government. Mathieu died on May 10, 1867 and was buried near the family home. 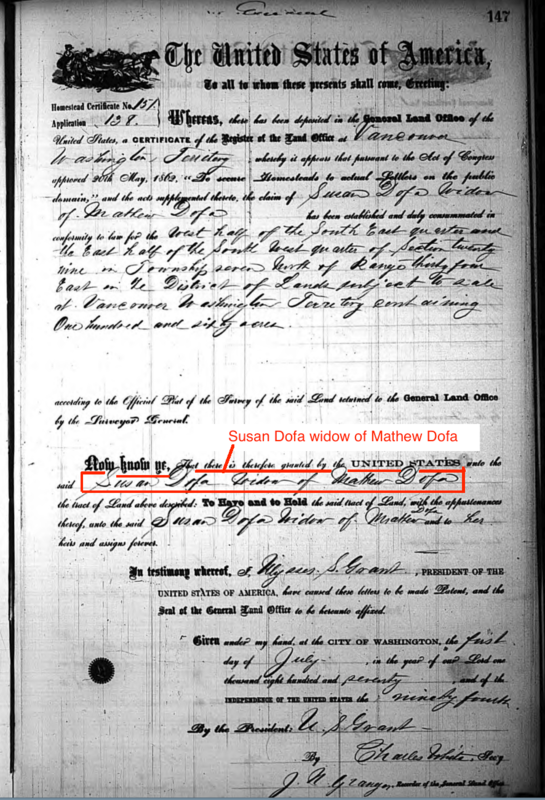 In 1870, the title of the family’s homestead went to Suzanne, who was listed as “Suzanne Dofa, widow of Mathieu Dofa.” Although widows could inherit homestead claims, Suzanne was a full-blooded Cayuse woman, and thus excluded from the 1862 Homestead Act, which suggests that the Land Office (located in Vancouver) was not aware of her race. Suzanne lived on the land in Frenchtown until her death on June 17, 1876, and was buried in St. Rose Cemetery. Her children married into the Gagnon, Woodward, Pambrun, and Bonifer Frenchtown families. Several of the Dauphin children eventually received allotments on the Umatilla Reservation. See 1860 US Federal Census, Census Place: Walla Walla, Walla Walla, Washington; Roll: M653_1398; Page: 285; Image: 298; Family History Library Film: 805398. Note that this is an approximation (e..g other censuses approximate birth date as 1822 or 1825). James Michael Gagnon, “A Gagnon Family History,” accessed July 30, 2016, https://gagnonhistory.wordpress.com/page-1/a-gagnon-family-history/. Oregon, Compiled Census Index, 1841-1890 [database on-line]. Provo, UT, USA: Ancestry.com Operations Inc, 1999, http://search.ancestry.com/cgi-bin/sse.dll?indiv=1&dbid=3569&h=26160939&ssrc=pt&tid=26191875&pid=1799020568&usePUB=true. “Julien Dauphin” on Find A Grave, accessed July 30, 2016, http://www.findagrave.com/cgi-bin/fg.cgi. See, for example, Harriet Duncan Munnick, Catholic Church Records of the Pacific Northwest: Walla Walla, Register II, Frenchtown, St. Patricks and St. Rose of Lima 1859-1872, P.6-7-8-9, B-35 Constant Dauphin (August 11, 1861). P.15, conf Jean Baptiste McDuffa (July 14, 1879). “Suzanne Cayouse Dauphin,” on Find A Grave, accessed June 1, 2017, http://www.findagrave.com/cgi-bin/fg.cgi?page=gr&GRid=51046846. CTUIR, “Treaty Between the Cayuse, Umatilla and Walla Walla Tribes, In Confederation, and the United States, June 9, 1855,” accessed July 27, 2016, http://ctuir.org/system/files/TreatyOf1855.pdf . See Probate records of February 26, 1877: Washington, Walla Walla County, Territorial Probate Records; Author: Washington (Territory). Probate Court (Columbia County); Probate Place: Walla Walla, Washington. U.S. Department of the Interior, Bureau of Land Management, “General Land Office Records,” Patent, glorecords.blm.gov, (http://www.glorecords.blm.gov/details/cdi/default.aspx?doc_id=1596428&sid=o2b42ydr.ibs#cdiDetailsTabIndex=0: accessed July 30, 2016), WAVAA 026873; entry for Dofa Mathew (individual) and Dofa Susan Widow (patentee), Meridian- Willamette, 007.0N – 034.0E, E ½ SW W ½ SE, Section 029, Walla Walla, issued July 1, 1870. See also pdf image of land patent at http://www.glorecords.blm.gov/ConvertedImages/CDI_1596428_Image_2986716.PDF. See Probate records of February 26, 1877. See, for example: U.S., Indian Census, June 30, 1887, Roll: M595_616; Line: 30; Agency: Umatilla (Catherine Dauphin); 1900 US Federal Census, Census Place: Reservation, Umatilla, Oregon; Roll: 1352; Page: 22B; Enumeration District: 0182; FHL microfilm: 1241352 (Felicite Dauphin); 1900 US Federal Census, Census Place: Reservation, Umatilla, Oregon; Roll: 1352; Enumeration District: 0182; FHL microfilm: 1241352 (Constance Dauphin).